Independence Day, also known as the 4th of July, is a United State federal holiday commemorating the historic event of the adoption of the Declaration of Independence, 241 years ago on July 4, 1776. That day the Continental Congress declared that the 13 American colonies regarded themselves as a new nation, the United States of America, and were no longer part of the England. Traditionally, people in the Washington DC metro area celebrate the 4th of July with picnics, parades, and fireworks. Here are just a few things happening in honor the USA’s Independence Day. 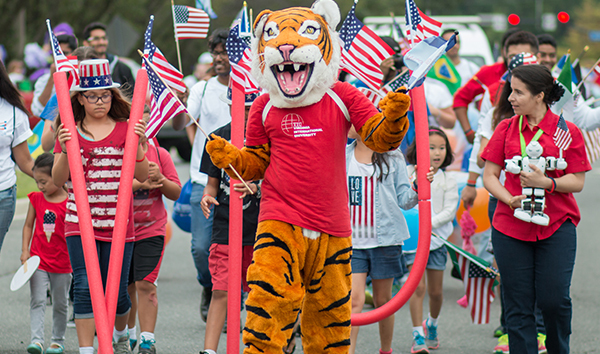 Virginia International University is participating in Fairfax’s 51st annual Independence Day Parade on July 4th. The celebration starts at 10 am; you can expect to see bands, the famous “Macy’s” balloons, historic vehicles, and various floats during the parade. To march in the parade for VIU, please contact at Hali at hdayberry@viu.edu. The VIU community will all be meeting at the main campus (4401 Village Dr) on July 4 at 8 am and will take the shuttle over to Fairfax. Visit Washington, DC to see a huge parade with military demonstrations, bands, floats, bands, and more. The parade begins at 11:45 am; the parade starts at Constitution and 7th Ave NW and travels down to 17th St NW. Concerts begin at 8 pm and feature a star-studded lineup of musicians and a performance of Tchaikovsky by the National Symphony Orchestra. The grand finale features jaw-dropping fireworks over the National Mall. Grab a spot to watch the fireworks at the National Mall by the U.S. Capitol, Lincoln Memorial, Jefferson Memorial, or East Potomac Park. Parking can be tricky so plan accordingly! Most towns in Northern Virginia have low-cost or even free fireworks and parades. Check online for the location of your local celebration. There will be designated areas to watch both, though you’ll likely be able to see the fireworks from many parts of your town.